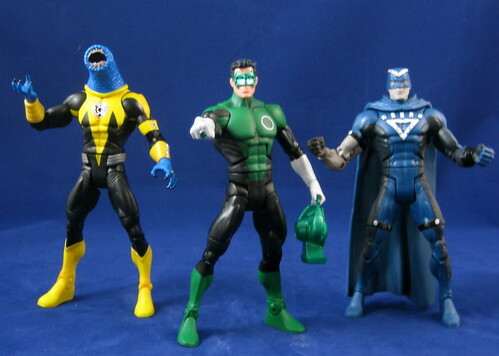 With the second wave of Mattel’s Green Lantern Classics starting to be found in stores, I thought I’d better get around to reviewing the first wave! This line is an interesting idea, and not a surprising one considering how central the Green Lantern stories have been to the DC Universe in recent times. 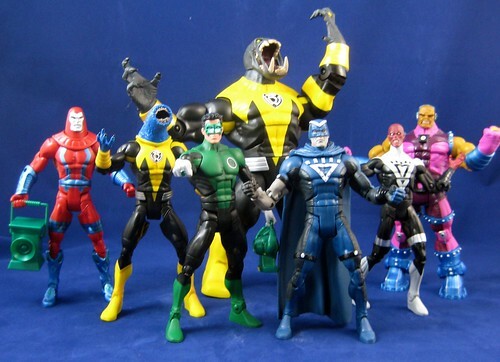 This is a very nice wave of figures with a couple of disappointments and an overall unimaginative character selection. Let’s get to it! Hal Jordan’s death, resurrection and rehabilitation all took place in my time away from comics, so it took me awhile to understand where Kyle Rayner fit into the Green Lantern picture. I understand now that many people who started reading DC Comics in the 1990s consider Kyle to be “their” Green Lantern. While he isn’t my personal favourite as a character, I am absolutely loving his figure in this series. I’m quite satisfied with the two versions of Black Hand that DC Direct has produced, but the Mattel version is pretty much on par with those two figures. There’s excellent detail, and it will fit in very well the Mattel GL crew. The only thing that takes the Mattel version down a notch for me is the blank facial expression. Black Hand is as mad as a hatter, so if there’s any figure that should be scowling or screaming, it’s this fellow! The interchangeable heads and hands for Low and Mash are easy to swap to make two completely different characters. I suspect many people like myself probably ended up buying two to display both, but it’s still a great way to make use of the similar GL / Sinestro Corp uniforms and provide more characters without forcing anyone to buy both for the CnC piece. There are both very fun, distinct characters that will compliment any GL display. A great inclusion in the wave! I’m not much of an army builder, but I definitely plan to get a couple more Manhunters to add to my display. These are a bit smaller than the DC Direct versions from a few years back, but they’re very nicely done, with new sculpting on the armbands, legs and of course head, with a nice menacing grimace. Metallic paint is used to really make the figure come alive, and he comes with a very distinct lantern which he can hold. Mine has a sticky left ankle, so I’ll be on the lookout for that with my future purchases. This is a great effort and one I’ll commend by buying more! 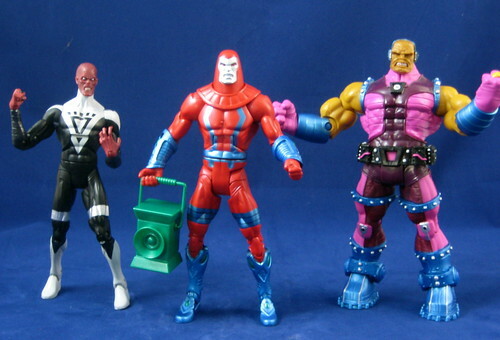 Black Lantern Abin Sur was the “eye-roll” figure for me when the wave was announced. There are so many characters from the GL universe that could have taken this spot, it hardly bears thinking about. If there had to be a Blackest Night tie-in in this wave, I can think of many, many characters that would have better filled the place. Sigh! The figure itself is well designed for what it is, but I bought mine only for the CnC piece, and it won’t be on display in my house – he’ll be joining Sinestro Batman in the fodder bin. Having said all that, however, it’s actually Mongul that’s the big disappointment for me in this wave. Partly, it’s because this is pretty much just a repainted version of the DC Superheroes Mongul, and I’m not wild about the colour choices made for the redeco. It’s also a disappointing figure for me because it’s a missed opportunity to give such an important character his first decent figure. DC Direct’s version is popular, but to me it’s ridiculously gigantic, while the DCSH . DCUC version is on the small side and too pin-headed. I would have expected Mongul to be a great candidate for the Collect and Connect treatment at some point, but I guess that’s not to be., and I think it’s a shame. Finally, we have Arkillo as the Collect and Connect figure for the wave. This is one of those odd double-ups between Mattel and DC Direct that have been taking place recently, with the two companies producing their own versions of Arkillo at the same time. While this Arkillo uses the fairly standard body that’s been used for Kilowog and others, the DCD version isn’t actually dramatically different. The only thing the DCD version has on this one is that it has Arkillo’s tongue necklace, so if that’s important to you this one probably won’t due. If I was choosing between the two figures, I’d probably choose the DCD version for that reason, but one version of Arkillo is enough for me, so I’ll stick with this one. The sculpting work on his head, teeth and hands are excellent. I now await the second wave of this line. We’ve yet to see the GL universe extended as imaginatively as it could by either DCD or Mattel. Here’s hoping that the wave of Green Lantern interest that is sure to come with the film provides opportunities to see some of the untapped gems from the classic years of the Green Lantern world as well as the many modern age “must-haves”. You can see more pics at Facebook, discuss this at the AFB Forum, and comment on this post to enter the March AFB Comment of the Month Contest! haha i agree with Sinestro Batman in the fodder bin, but Abin too? maaaan! I pretty much agree with you on every point Andy. I haven't seen this series in person yet, although it has been out a while. That's just as well, since the only figure I'd even likely want to buy from this wave is the Kyle Rayner.